Blog Where have I been? About a year ago my health began spiraling down to the point that I was feeling at least 10 years older than I am. 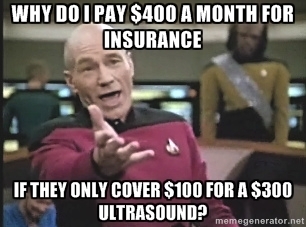 My health insurance isn’t all that great (public school teacher) and only pays a pittance. I racked up bills for MRIs and other diagnostics like you wouldn’t believe. Thank you, Indiana, That’s why the Hoosier state is in the black all the time. They pay so little to their workers. But I digress. 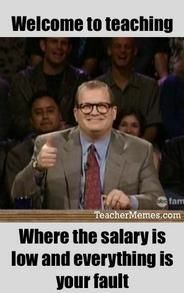 You already know how poorly teachers are paid. Teaching has been my full-time job these last 18 months. Why did I get a full-time government job, you ask? For the insurance that isn’t paying my medical bills. As you can imagine, I’m feeling pretty silly for thinking another career was a good idea. But there’s more to it than that, and I’m praying about how to share that part with my readers one day. I received a diagnosis of Fibromyalgia about seven or more years ago. I’ve managed it quite well until recently. It was getting so bad this past year that I would be in bed by 5:00 pm every night. As you can imagine, that cut out at least six hours of my day when I could be writing, blogging, communicating with my readers and working after-hours at my job (the paperwork I have is ridiculous). I hurt so bad it was painful just to roll over in bed. I would easily sleep 12-14 hours a day if I had the time. I would fall asleep sitting in my chair. My restless legs (another syndrome) became outrageously out of control. I walk at least 7-10,000+ steps a day at my job (Fitbit says so!). I need energy and I just didn’t have it. Some days it was all I could do to walk one step at a time and talk myself through it. The brain fog was another issue, and I was forgetting details in my paperwork at my job (fortunately nothing serious) and was embarrassed by my oversights. I went to the doctor who ordered another sleep study (I’d had one years ago) but my insurance would only pay a portion leaving me to pay $1600. That wasn’t an option, but I was bound and determined to whip this condition and not submit to it. I read up on anti-inflammatory diets, and while I’ve done them countless times before, I was beginning to accept and realize I needed to leave dairy completely out of my diet (I was already limiting my grains and sugar), and eat only organic, whole foods including grass-fed beef (not easy to find where I live). I prayed and asked the Lord what to do. If He wouldn’t provide the funds I needed for more tests, and He wouldn’t touch me and heal me instantly, then I needed Him to show me how to heal myself. My quality of life was very poor. I was only able to stay out of bed for about 8-10 hours a day. And when I did try to sleep, my restless legs kept me awake. It was a vicious cycle of sitting up in the recliner to sleep and going back to the bed. I was back and forth all night in terrible pain. Last week I found some restless leg medicine that I didn’t know I had. Once I had started cutting caffeine out of my diet after 12 noon, my legs were much better at night until these unbearable months of fatigue hit me. I had always thought the RLS was from caffeine consumption. But the past six months or so my RLS was affecting my arms, too. And it kept me awake. I was never asleep more than about 20 minutes at a time all night long. When I found the medicine, I decided to give it a try again. He agreed. It was not a usual sight anymore to see me in the kitchen. But my illness did have the nice side effect of the twins (with autism) learning how to cook more. 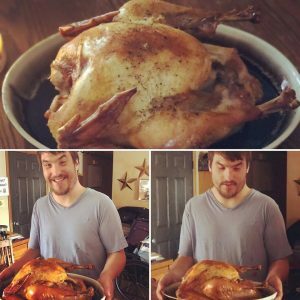 Isaac even made the Thanksgiving turkey this year! So, that’s where I’ve been. I hope I’m coming back. Stay tuned for where we’re going in 2019. There are some super-exciting things coming! I can’t wait to share them all with you. I’ll be sending an end-of-the-year newsletter out soon, so be sure to subscribe so you can learn about everything that’s happened and is happening! I can’t wait to take you with me! I hope you haven’t left. I hope you’re still there, listening. I promise I won’t cry on your shoulder (which is why I’ve not written much). I’m back in the land of the living! How blessed I am to get another chance! Do you live with a chronic pain condition? How do you manage it? Do you know someone who does? How do you help them? 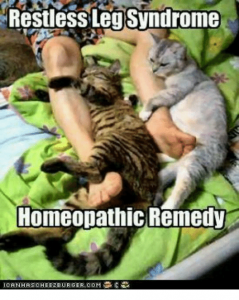 And do you know of any good homeopathic remedies for RLS and Fibro? I’d love to hear about them! Karla, so sorry to hear about all the trouble you’ve been having but glad you’re on the uphill. I have chronic pain in my leg but I think it’s sciatic related. I’m going to physio tomorrow to see if they can do something the chiropractor hasn’t been able to. Maybe some new kind of acupuncture? But it might just be aches and pains of old age! I have plenty of energy (when I don’t go crazy and physically act like I’m 24 again! ), and I sleep well, thank the Lord. I pray God will truly touch you and heal you, in whatever way He sees fit. Glad there are exciting things ahead for you! Chronic pain is such a challenge for these earthen vessels. I am so thankful and hopeful for the day when we shed these avatars and walk in the fullness God has for us! I hope you find relief for your pain. Thanks so much for checking in with me and leaving a comment. It means so much! Happy Christmas! had such a rough time and it’s so nice to read your post. I struggle with diverticulitis so I can only imagine what you go through. Yes, stress is a major trigger for all illnesses, I believe! That and sugar, and our society is so sugar-centered. I don’t do as well as I should to avoid it. It’s everywhere and in everything. Ugh. I am so happy to see you here and thank you for posting my blog on your social media. You’re a true friend. I’d love to visit soon about our mutual son stories! Hugs and tons of love to you! I’m so sorry you’ve been dealing with these health issues, Karla. Autoimmune disease can be so debilitating. Stress exacerbates it, but life is filled with stress and having an autoimmune disease and the associated costs add more stress. I’m glad you are seeing some improvement and pray that it will continue and the stress levels will dissipate. Thanks for your prayers, Janet! Yes, stress and the stress of the financial drain don’t help at all. 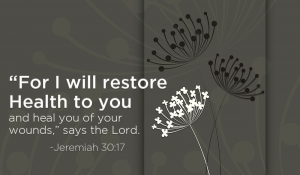 I am learning to rest in the hope of God’s promises! He is Jehovah Jireh. He will not see me forsaken. Thank you for praying for my peace. It means a lot to me! And thank you for visiting here! Karla, sorry to read about this but glad you’re not giving up. Keep praying. I’m praying for you as well. Have you tried OTC MidNite to sleep? They say to take 1…I take 2 a 1/2 hour before I get into bed and another 2 when I do get into bed. Usually works well! 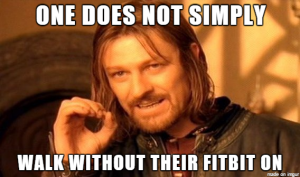 Been taking them for years. Elaine, you’re a true blue online friend, and I thank you so much for praying for me! I have never heard of MidNite. I will look into it! Thanks for the tip! RA here. Autoimmune is so hard. Sometimes I wonder if it is from everything we internalize and do as moms. It has to come out somehow. Been a very hard season here my autistic 18 year old has been a handful to say the least and we had to find new resources to help him. So thankful I found you this year. Make sure to take time for you. I’m so sorry you’ve been going through all this, Karla. 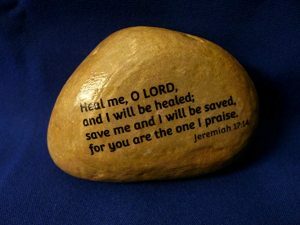 God will lead you to the answer for your health. Perhaps He’s also leading you to your answer for better financial health, as well. He did both for us over twenty years ago when we were introduced to Reliv, and we’ve seen many people get help with Fibromyalgia, RLS, RA and many other autoimmune problems. You can contact me if you’d like to know more. I’ll never pressure you or anyone. I’m the world’s worst sales person, which is why I’d rather be writing. I know the products, though, and I have seen many lives improve with them. Praying for your healing, however God wants to accomplish it. It seems like just a couple of years ago when I first met you on line, then eventually in person. Our children have grown up and all done amazing things. Both my children are married and have two children each. My daugther’s youngest turned 4 just this week. Keep up doing amazing things! I am headed off to spend the winter in the southwest for the 2nd year in a row.